This interview was previously published in Sculpture, 35(9), November 2016, pp. 18-23 with the title "Submerged: A conversation with Jason deCaires Taylor". The article also made the magazine cover. Jason deCaires Taylor. 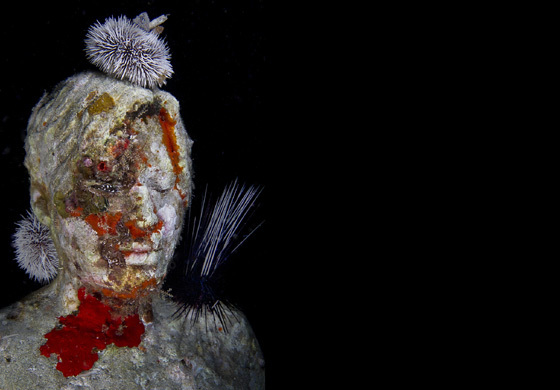 Lily with urchins, detail from The Silent Evolution underwater installation consisting of 420 sculptures, (2009). Cancun, Mexico. Photo courtesy the artist. In recent years, deCaires Taylor has installed underwater figural sculptures along the coasts of Grenada, the Bahamas, Cancún, Mexico, and in Coloradas Bay, Lanzarote, Canary Islands, Spain. In 2015, he produced a different kind of work on the banks of the River Thames, in view of the Houses of Parliament. The Rising Tide (2015) was intended as a political statement, referencing the four horsemen of the apocalypse. Placed within the river’s substantial seven-meter tidal flow, the figures [appeared] in full at low tide, then [disappeared] as the water rises. R. J. Preece: Your work has gained widespread coverage across general media outlets. As we know, the art world can be very old school and conservative about such popularizing approaches. What do you now think about this international coverage? What has it done for you— and what hasn’t it done? Jason deCaires Taylor: The coverage has been very intense. It sometimes makes me feel like an observer or commentator looking in. It’s interesting— I place something in an inaccessible place, and it becomes more accessible than ever before. I just saw a report that, over the last five years, I have connected to an audience of over a billion people, certainly a sign of the times and testament to how digital media is rapidly changing the world and can help shape artists’ careers. It also has changed my practice significantly, because I spend as much time on the documentation of my work as on the construction. I find myself making details on works that will be lost to the sea within days, but will be ever present in my images. The media attention has, without doubt, helped me to attain many new commissions, and it has really helped me to connect with a wide-ranging audience, which is vital when forming a debate around global environmental issues. Although I studied sculpture for my degree, I still view myself as an outsider artist, someone who has not necessarily passed through the traditional gallery system. As a result, I probably focus more of my energy on the actual site-specific installations and pay less attention to the art market and exhibitions. R. J. Preece: When did you first think about placing sculpture underwater? Jason deCaires Taylor: I have been exploring the ocean since I was eight years old. Even at an early age, I was fascinated by its endless possibilities, presenting both a physical space to explore and a mental place of escape. I have been interested in developing art projects using the underwater world ever since I was at Camberwell College of Arts in the early 1990s. At the time, I was very much influenced by the Land Art and earthworks movements and felt the ocean represented a vast arena to further explore the boundaries of art. At art college, I focused on creating landscape installations in both urban environments and coastal settings. Studying in central London, however, made the possibility of realizing an underwater project impractical, so I put it on the back burner. I was also troubled by the resources and materials that large-scale installations consumed. It was only when I realized the conservational element of my work that I became more comfortable with it. R. J. Preece: How does your process work? What things do you have to consider as you progress from idea, to making, to installation of the works? Jason deCaires Taylor: I often begin my installations by life-casting models, mainly local residents whom I invite to the studio and then full-body cast. From the plaster positives, I create a series of molds that go on to be filled with high-density, pH-neutral marine cement. This material is safe to install in the sea, and it can mimic the natural rock formations on which corals like to settle. From an early point, I have to work out the weight loadings carefully, as well as anchoring methods and transportation, because floating or craning a 10-ton structure in the ocean leaves little room for error. Artistically speaking, I really need to study the site where the work is going to be placed, the viewing angle, and the scale. Sometimes I place my works in an open space and climb to the top of a nearby building to view them, because this is the angle from which you are most likely to see them when they’re underwater. I also consider the color of the water, atmosphere, visibility, current, existing marine colonization, and direction of the sun. They all play a fundamental part in how the final work will be interpreted. Jason deCaires Taylor: There are many technical challenges. The majority of public land sculpture uses metal to some degree. Underwater, this is prohibited because the life span is short and not very effective when trying to seed corals, which can take hundreds of years to form. The open ocean is also a very volatile place; powerful waves and currents can inflict immense forces. With this in mind, I have to choose the placement sites very carefully, generally areas that have barren seabeds and are protected by some kind of landmass. Securing permits is one of the hardest parts: months— sometimes years— are spent conducting environmental impact analysis, archaeological surveys, and underwater mapping. R. J. Preece: How have fish and coral responded? Jason deCaires Taylor: Every time that I visit the works, there is some kind of surprise. I have more than 25 years of diving experience, and yet it is impossible to always predict the changes. On every level, you can see incredible transformations. On a micro-level, you can see intricate patination of coralline algae, white tubular worms, pink sponges, and coral membranes that have pores like human skin. Zoom out a little and you can see fire worms feeding on the coral, crustaceans such as hermit crabs and coral-banded shrimp grazing on algae, and seaweed, starfish, and sea urchins marching across the surfaces, seeking protection in crevices. The large congregations of figurative works form “void space” areas, which provide protection for shoaling fish, like snappers and wrasse. These then encourage pelagic predator species such as sharks and barracudas. Over the years, I have tried to tailor the installations for endemic marine life— positioning them in areas that will catch natural coral spawning, creating surface textures that help embryonic marine polyps attach, and making cavities of particular sizes to attract certain species to take residence. The biggest surprise for me has been the rate at which the sculptures change; sometimes within a few weeks, they can become barely recognizable. The color pigmentation of some of the sponges is something that I have never seen re-created by any industry or artist’s palette. Jason deCaires Taylor: I feel that tethering the works to a business model makes them far more sustainable in the long run. Local authorities now charge a small entrance fee for the large-scale installations. This helps to provide revenue for staff and tour operators, but more importantly it helps to finance a system of marine patrols for coastal waters. Many of the issues facing our oceans stem from the fact that the laws protecting them are not enforced, and being able to provide funds for protected marine areas and park wardens is a huge advance. An important part of the projects has also been about changing the iconography of their surrounding areas, highlighting local natural and cultural resources rather than recreation; many of these areas are known only as places to jet ski and drink piña coladas. I call many of the projects “museums” because museums are synonymous with preservation, conservation, and education— I want people to assign those values to the underwater world. In terms of shortcomings, the fact is that to really appreciate and connect to the works, it is best to scuba dive to them, and this obviously limits the audience. My greatest challenge is balancing the creative process, which involves spontaneity, evolution of ideas, and experimentation, with a long and often drawn-out process of politics, planning, and logistics. R. J. Preece: To what extent do you consider your underwater works "eco-driven"? Jason deCaires Taylor: I would say the ecological aspect has been one of the major forces behind them. Besides the practical benefits of creating marine habitat, the narrative of the works also concerns wider ecological and social issues, like the Anthropocene and our apathy toward a rapidly changing planet. Once the sculptures have metamorphosed into something else, only traces of humanity will live on. The relationship has been balanced; we are reminded that we are not separate from the environment but an integral part of it— an ultimate interdependency, which could bring acceptance and hope. The otherworldly presence draws the viewer in with intrigue, a familiar face in a strange world, a bridge from which to explore a fundamental part of our planet. R. J. Preece: Your work in the Thames seems quite different. How did the process change from that of the completely underwater works? Jason deCaires Taylor: The Rising Tide, although constructed using similar techniques to the underwater reef works, was markedly different. The submerged artificial reef installations focus on the environment itself being the artist, blurring lines between ancient, contemporary, and apocalyptic civilizations. In the Thames project, the changing tide becomes the protagonist, and the location in front of the houses of Parliament, the activist. The entire project was planned and executed within two months, which gave it a real feeling of momentum and protest. Strangely enough, the site was a five-minute walk from where I spent most of my time as an art student, so it felt like a homecoming. R. J. Preece: What things did you not learn in your university education that you wish you had? Jason deCaires Taylor: Diving, of course. Jokes aside, I remember that we were not allowed to use workbenches and always began our projects working from the floor. It was back-breaking, and we quickly learned to scale up the works and think on a different scale. I would have loved to have taken this a step further, always starting an idea from a different point, context, or environment. I really believe that art, teamed up with science, can provide some very powerful synergies. Maybe a greater focus on collaboration would have been beneficial. R. J. Preece: Looking back, what gave you an important break into the field? Jason deCaires Taylor: Losing everything and becoming disillusioned. I spent years in unfulfilling occupations and reached a point where it became critical for me to concentrate my efforts on something worthwhile, to leave this life knowing that I had made a small difference. Many of the skills I developed in these “unfulfilling occupations,” though, have aided me in the underwater projects. Building sets for theaters and corporate exhibitions gave me a firm grasp of engineering logistics, and teaching scuba diving obviously gave me the technical ability. [For a diversified media coverage analysis in a similar vein, see R . J. Preece’s 2014 article "Media push and pull: Tony Matelli’s Sleepwalker and the "Creepy statue’ controversy". Sculpture, 33(6), 20-1 (and only here). A quick guestimate is that deCaires Taylor has 30 times this amount of coverage to date. © 2005-2019 artdesigncafe.com. All material contained within artdesigncafe.com is the copyright of its respective owners. This article may not be republished, rewritten or redistributed without their permission.